A pool is a great way to enjoy the summer and cool off in those really hot days. However, for most living in Canada and Northern USA, a pool is seldom hot enough and only on those rare heat wave days do we feel like we have enough heat. Because of the colder nights most pool owners find that an additional heat source is needed such as a propane or natural gas heater. However, the cost to heat a pool can be significant! Solar has long been considered the most cost effective means to heat a pool. However, traditional solar pool plastic mat heaters have many limitations. In the past vacuum tube solar pool heaters were simply too costly. 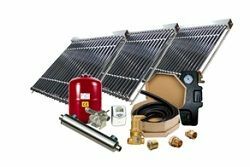 However, with the global demand for solar heating at a record high, the cost of vacuum tube collectors are at a record low allowing pool owners to capitalize on the opportunity to heat their pool with a much superior system. 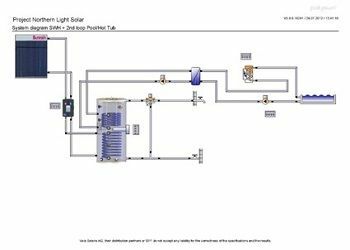 Solar vacuum tubes have the advantage for pool owners. Never lose there heat no matter what the wind is like or the temperature is outside. Vacuum tubes work in indirect lights such as cloud cover and will continue to work even after the sun has set. Our solar pool heating system use a stainless Steel or Titanium heat exchanger so the pool water never comes in contact with the solar collector. A heat exchanger means the entire solar system is a closed loop and can be pumped with as little as 20 Watts of energy about 10 times less than a pool pump requires to move the water up to the roof. Solar Pool Heaters that use vacuum tubes can deliver heat energy to the pool even in freezing temperatures. The outdoor ambient temperature has little effect. Solar Pool Heat exchanger is a specially designed heat exchanger that is meant for high flow and high volumes of a pool. It will not restrict the flow like most other heat exchangers. The titanium construction is available for pools using higher chlorine levels or for salt water pools. Dual Zones – A solar pool heater is generally only used during the summer months unless there is an indoor pool. Adding a winter heating zone is a great way to let your solar pool heater pay for itself 365 days a year. A second zone utilizes all the same heating parts the pool heater uses so it can quickly be adapted to provide you with home heat or domestic hot water in the winter month when it is not providing energy to the pool. 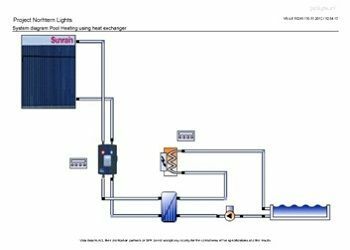 Solar Pool Heating with Heat Exchanger. Solar pool heating with a domestic hot water system, storage tank also stores energy to deliver to the pool when it needs it not just during the day. Each home is different and as such the size of the house, its climate and the insulation value of the home will play a big part in choosing a proper solar space heater.The larger system the more storage will be needed. Generally for Northern Climates we recommend 1 x 30 tube vacuum collector for every 300 square feet. In warmer climates this can be reduced to 1 x 20 tube vacuum collector for every 400 square feet. Storage tank should be equally sized to match the number of collectors. The rule of thumb however is more is better when it comes to storage size. Most tanks come in 50, 80, 119 gallon sizes for larger homes it is best to add multiple storage tanks and run them in parallel. We recommend minimum of 40 gallons per 30 tube collector so a 3 collector system will require 120 gallons of storage. SpirotechAutoClose Solar Air Vent - World's only solar Auto Air Vent!